Hewnda Stainless Steel Pasta Maker 5 Noodles Mold Pasta Maker Citrus Juicer by Hewnda at Baking Love. Hurry! Limited time offer. Offer valid only while supplies last. Noodles machine made delicious noodles is very convenient and hygienic. It's easy to use and saves you time. It can also be used to extract juice. View More In Juicers - Page 4. Noodles machine made delicious noodles is very convenient and hygienic. It's easy to use and saves you time. It can also be used to extract juice. After use, the machine can be unscrewed and washed with water. Use the program: 1. Knead the dough with water to make it soft enough and add some cooking oil when necessary. 2. Unscrew the lid, put the dough, vegetables or cut into fruit tube, and then twist the handle, noodles or juice will come out. 3. Place the bottom of the machine near the water and the noodles will easily come out. 4. After use, disassemble and soak in water for easy cleaning. 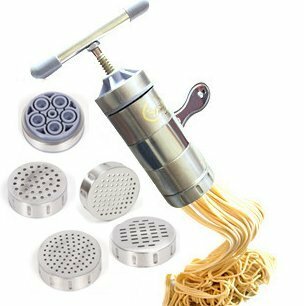 Main features: Making fresh noodles, juice extraction is simple, save time. Easy to use, easy to clean. Safety: No dough leaks when pressed. If you have any questions about this product by Hewnda, contact us by completing and submitting the form below. If you are looking for a specif part number, please include it with your message.